Bruises and blood clots are both ways in which the body heals itself. Both can result from damage to blood vessels due to an injury. However, it is important to understand when a bruise or a blood clot signals a more serious condition. Bruises are typically associated with an injury. For example, after a fall or a hard bump, the blood vessels in the skin burst and leak blood into the surrounding tissue. This blood becomes trapped, showing as a discoloration beneath the skin. Bruises are often referred to as black-and-blue marks since the lack of oxygen reaching the trapped blood makes it appear blue. Bruises follow a standard course: initially, the reddish appearance of the bruise will begin to turn into a dark black-and-blue mark during the first few days after an injury. 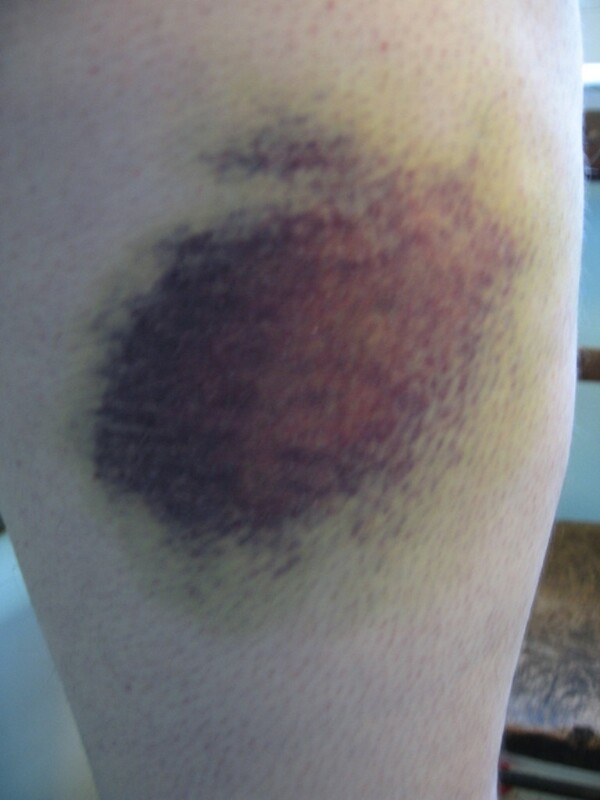 During this initial stage, the bruise will often be painful if touched or pressed. This is a result of the injury that caused the bruise, not the bruise itself. As the bruise heals, it will typically change color, eventually becoming yellow and finally fading away altogether. If a person experiences and unusual amount of bruising, a vitamin deficiency or bleeding disorder might be the cause. Some medical conditions, including a low blood platelet count or low clotting factor, can also lead to excessive bruising, as can the use of anticoagulants, commonly known as blood thinners. If a person notices a bruise that is not following the standard healing pattern, or finds themselves unusually prone to bruises, they should see their doctor. Blood clots, on the other hand, have a variety of causes. The least alarming clots are those associated with the natural healing process after a cut. Damage to the area surrounding the cut causes the blood to coagulate in order to stop any bleeding. Blood clots of this type are normal and will disappear on their own with time. But if blood clots become larger than necessary, or form from some cause unrelated to injury, it could be the sign of a much more serious condition. Blood clots that form deep in the tissue, known as hematomas, do not follow any standard course. Their course is highly dependent on their size and the place in the body where they occur. Large blood clots, as well as those that occur in muscles or organs, will often require medical treatment. A blood clot in any of the arteries that lead to the brain or a clot in the brain itself will typically lead to a Symptoms of a stroke include numbness, weakness on one side of the body, or slurred speech. A blood clot in an artery of the heart will typically lead to a heart attack. Symptoms of a heart attack include chest pain or shortness of breath. A blood clot in an artery of the lung will typically lead to a pulmonary embolism. Symptoms of a pulmonary embolism include chest pain or shortness of breath..
A blood clot in an artery leading to the intestines will typically cause acute mesenteric ischemia. Symptoms of mesenteric ischemia include abdominal pain or blood in the stool. A blood clot in any deep vein will typically lead to deep vein thrombosis. This most commonly occurs in the leg. Symptoms of a of deep vein thrombosis include unusual leg pain. In both the case of unusual bruising or symptoms of a worrisome blood clot, the sooner treatment begins, the better the outcome tends to be. At Atlantic Coast Healthcare and Rehabilitation Center, in Lakewood, NJ, we pay close attention to the needs of our residents.